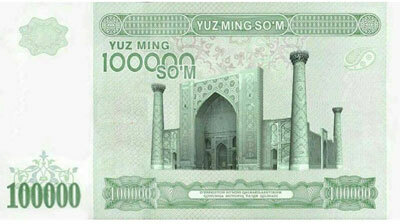 Uzbekistan – Broken equipment delays release of 100,000 sum new banknotes. According to news published in Tashkent the two printing machines broke down in the facility involved in the production of the new banknotes of 100,000 sum (UZS100,000.1). The breakdown was linked to the frequent power cuts in the area where it is located. Fixing the German machines will cost some three million euros, as much as buying new ones. These notes were supposed to be released in Navruz, March 21, but so far there are only 20,000 banknotes printed, which will be distributed to government officials and members of the presidential staff. Public release will have to wait until the situation is resolved.